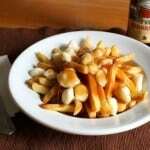 Made with French fries, cheese curds, and gravy, this gluten-free poutine is rich and wonderful. Prepare Gravy: Just before frying french fries, prepare gravy. Reserve one tablespoon chicken stock. Set aside. In medium pot, melt butter over medium-high heat. Add sweet rice flour and whisk to combine. A thick paste will form. Cook, whisking constantly, until mixture turns lightly golden brown, about three minutes. Whisking constantly, add remaining chicken stock and all beef broth in a slow and steady stream. Cook until gravy thickens, about four minutes. Combine cornstarch and reserved chicken stock. Whisk with a fork until smooth. Add to gravy. Continue whisking and bring gravy to a boil. Reduce heat to low. Add vinegar and season to taste with salt and pepper. Whisk gravy occasionally while you prepare the french fries. Put together the Poutine: Remove cheese curds from refrigerator. Set aside. Fry french fries as directed in recipe. Divide cooked french fries between four bowls. Top with cheese curds and gravy. Serve immediately.